What Is Microprinting on a Check? Wondering what the letters “MP” mean next to the signature line on your check? Have you discovered hidden text on currency or ID cards? Microprinting is a security feature that makes it harder to fake official documents and print fake checks. When you see MP on your checks, it means that the check printer used microprint (or micro-security print), among other things. Microprinting is the printing of extremely fine details on a document. 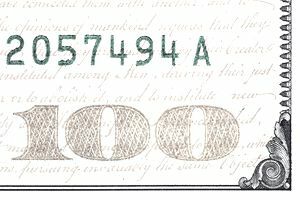 When used as an anti-fraud tool, small letters are often printed so small that they cannot be read by the human eye, resulting in tiny words "hidden" on the face of checks and ​currency. More importantly, microprinting helps you verify when a document is legitimate. On checks, the signature line is typically printed with this microprint. But instead of printing an actual line (which is exactly what it looks like), a series of words are printed where you sign your name. The words probably say “AUTHORIZED SIGNATURE,” “MICROPRINT SECURITY,” “ORIGINAL DOCUMENT,” or similar. Don't believe it? Grab a magnifying glass — a powerful one — and take a look for yourself. In addition to microprint on the signature line, you may find small words printed elsewhere on the check. Check borders (which also look like lines) often contain tiny letters. With a decent printer, scammers can make checks that look legitimate, but security features like microprint make the job harder. Thieves steal bank account information, print fake checks, and then go around spending money from somebody else's account. Even “official” bank checks like cashier’s checks can be fakes. When microprint was first used, very few copiers or scanners could copy the small letters with sufficient resolution, so those tools would produce an easy-to-detect fake. Even with a powerful scanner, you’d need a very fancy printer to clearly print tiny letters. These hurdles make it hard for anybody (except the most dedicated and best-equipped scammers) to create genuine-looking fakes, although it’s getting easier as printers and scanners improve. You aren’t required to buy checks with microprint, but it is probably a good idea to do so. For example, you can print your own checks (and technically you can write a check on almost anything) using a home printer. However, you may find that your checks are rejected, or you may be charged additional fees for using “alternative” methods. If you purchase blank checks (that contain other security features as well), you should not have any problems if you use your printer just to print the payee information and amount. Check stock purchased from reputable check printers will almost certainly feature microprint. To see microprint (or to fully appreciate it), you’ll most likely need a magnifying glass or similar. Photographers can use a macro lens for extreme close-up shots. Take your time, and examine anything that looks like a line or border. To determine if a document is legitimate, find out what security features it uses. Most checks list the security features in a box on the back of a check. Government agencies often list the security features of currency and other documents so that you can figure out when you’re presented with legitimate items.